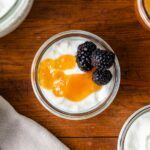 It’s super simple to make homemade yogurt right in your own kitchen! After making a batch or two, you’ll see why making your own is so much better! In a 4-quart kettle, heat the milk to 180-185 degrees Fahrenheit. Once at temperature, immediately remove the milk from the heat. Cool to 110-115 degrees Fahrenheit. To speed up the cooling, place the kettle in an ice water bath. When at 110-115 degrees Fahrenheit, whisk in dry milk and yogurt until smooth. Keep the mixture at 110-115 degrees Fahrenheit for 4-8 hours until thick with a slight tangy smell. To keep warm, turn on the oven to the lowest temperature setting. Once heated, turn the oven off and set the kettle in the oven with the lid on. Close the oven door and check the temperature of the yogurt every hour. If needed, heat the oven again and turn off. When the yogurt has fermented for the desired time, remove from the oven and pour in a strainer lined with cheesecloth. Strain 2-6 hours depending on the thickness desired. Once strained, place in an airtight container and enjoy.